The Swim Center was the perfect place to meet for Rockville Kidical Mass’s second ride, as the weather was quite sticky! We took a leisurely 1.5 mile ride around the neighborhood surrounding the Swim and Fitness Center. The town maintains some very handy multi-use trails that connect the Swim Center with nearby residential streets, as well as the skate park, basketball courts, tennis courts, baseball fields and playgrounds in Welsh park. This time around, we had twelve riders, with four kids on bikes and one in a trailer. While one of our little riders wasn’t quite ready to venture out on the street, we appreciate her and her mom’s willingness to try something new. We know that children are all at different levels of comfort riding on the street and completely understand if a kid needs to go very slow or even drop out. The Kidical Mass rides are meant to build confidence by riding in a group, not force kids into a situation they aren’t ready for. If you aren’t sure if your kid is ready or not, we invite you to come and see how your child reacts. Even if you can’t ride with us at the moment, you are always welcome back for future rides! We also had the pleasure of having a family travel all the way from Washington D.C.! They hadn’t been able to make the D.C. rides, so they thought they’d visit us up in the suburbs. 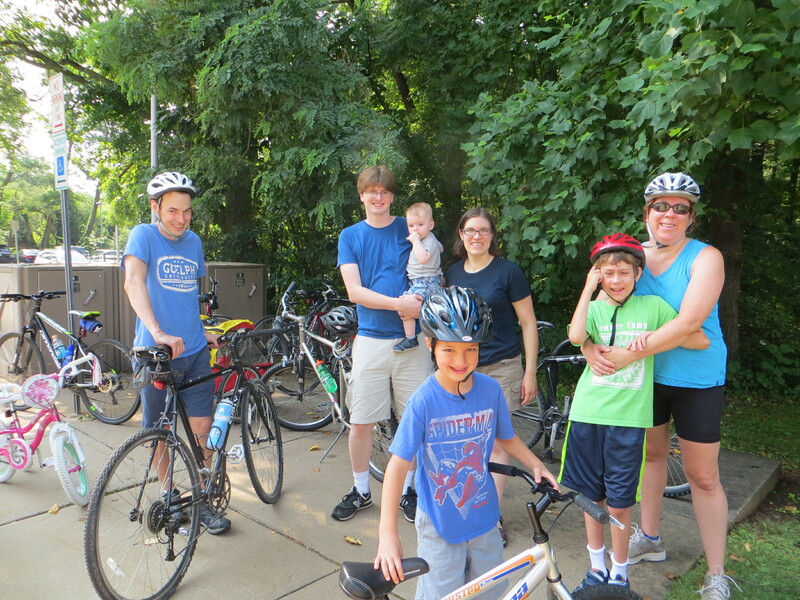 If you can’t make our rides or just want more family biking opportunities, check out our sister groups in Gaithersburg, D.C., Arlington, Falls Church, Alexandria and if you want to make a day trip of it, Baltimore. If you have older kids capable of riding longer distances (8-15 miles) or have some adult biking time, be sure to see the Rockville Bicycle Advisory Committee’s Meetup group, webpage and Facebook group. We wrapped up the ride with orange and raspberry ice pops, slurping down the cold goodness to beat the heat. We hope everyone had a great time and enjoyed riding with us. Our next Kidical Mass ride is on Saturday, August 9 at 10 AM. We’ll be meeting at the Croyden Creek Nature Center to ride to Rock Creek Park and back. Hope to see you there!